The odyssey of The Zombies begins in St. Albans, Hertfordshire, England, a hamlet some twelve miles north of London. Rod Argent formed the first iteration of the group in 1961 from the student body of St. Albans School. Argent (keyboards) and Paul Arnold (bass) were neighbors who knew each other from primary school. Argent recruited Paul Atkinson, who played guitar in a student folk music club. Rod Argent remembered the first rehearsal. “This is where I met Colin, thinking of the band in a three-guitar format. Colin was supposed to be the rhythm guitarist, and I heard that he sang a little bit from a musical friend. We all got together, played a bit of an instrumental, and then in the first break, I wandered over to a beat-up piano and started playing Nut Rocker, the old B. Bumble and the Stingers hit. Colin ran over and thought it was fantastic. He said, ‘You've got to play piano in this band!’ And I looked him and thought, I don't know, groups are guitars - that's what we should be doing. I wasn't so sure about this. Backed by a throng of fans from the local villages, the Zombies won the competition and the recording session. Two songs were recorded at the demo session — Argent’s self-penned It’s Alright With Me and Gershwin’s Summertime. More important though was the fact that several companies offered the band recording contracts based on their performance in the competition. Chris White’s uncle was a musical arranger and suggested they contact songwriter/producer Ken Jones for advice on their next move. Jones broke down the contract offers and explained them to the group. 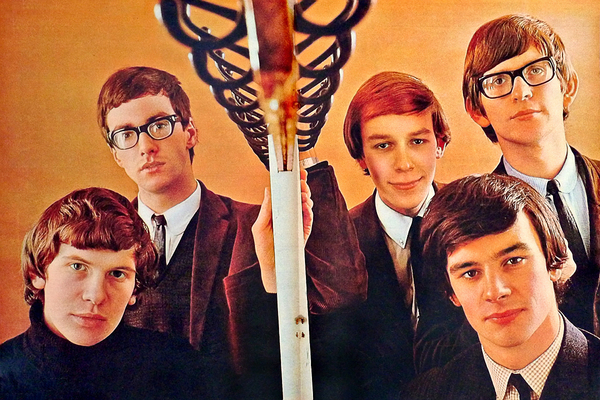 Decca Records offered a three-year deal and the Zombies became professional recording artists. L-R: Chris White, Colin Blunstone, Rod Argent, Paul Atkinson and Hugh Grundy. 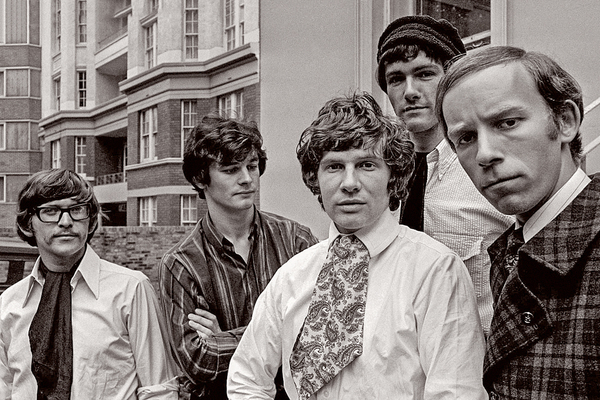 The Zombies next release was Leave Me Be, a forgettable number in the UK. However, the band scored their second top ten hit in the states with Tell Her No, recorded on November 25 and released early in 1965. In the UK, the song reached a disappointing #42 in February of 1965. (15) It was just the start of a downward spiral for the band. Though artistically sound, their next ten singles flopped. Some blame it on the fact their music became too adventurous for radio. The lack of sales took the wind out of the band’s sails and they were struck by the fact that maybe they were just one-hit wonders. By early 1967, their contract with Decca expired. They signed with CBS Records for a one-album deal knowing it would be their last. That album was Odessey and Oracle. 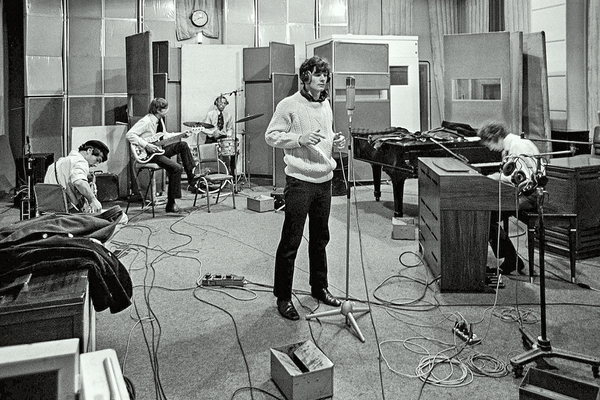 Photo from the Odessey And Oracle session at Abbey Road Studios in 1967. Two singles were released from the album that went nowhere. Disinterested record buyers and unprofitable tours hit the band hard. They split in December of 1967 after a show at Keele University. CBS had a number of mailings of the album to radio stations across the US. Nothing happened until a DJ, reportedly in Boise, Idaho, dropped the needle on Time Of The Season. Slowly, the song gained traction. Now it was on the radar of CBS. They released it as a single late in 1968. On February 8th, 1969, the single hit the Billboard chart. By March 29th, Season peaked at #3 where it sat for two weeks. (12) (13) Like their namesakes, the Zombies had risen from the dead. The group was hot again and CBS wanted more product. Only the band members had moved on. Where a vacuum exists, some force will come along and fill it. Such was the case of Delta Productions. In 1997, the five original Zombies reunited in November to promote the release of Zombie Heaven, a 120-track CD compilation of their previous work. In 2000, Blunstone and Argent reunited under their names. In 2001, they moved to the US. In 2004, they re-billed themselves as the Zombies. Paul Atkinson joined the group for a benefit performance at the House Of Blues in Los Angeles. It was his last performance with them as he died from liver and kidney disease on April 1, 2004. In 2011, Argent and Blunstone released an album titled Breathe Out, Breathe In and toured around the world to promote it. In 2015, the Zombies announced another tour to promote the live performance of the Odessey and Oracle album. In 2017, the four surviving members of the Zombies reunited for a tour of the 50th anniversary of the release of Odessey and Oracle. That's Johnny Holliday introducing the Zombies on the premier episode of Hullabaloo dated January 12, 1965. CBS This Morning ran an excellent feature recently on The Zombies. She's Not There has a life today in a TV commercial. 3) Catlin, Roger. Songfacts, Interview with Rod Argent of the Zombies, Link. 4) Macek, J.C. III, Pop Matters, "There Are No Half-Measures": An Interview With the Zombies' Rod Argent, November 3, 2013, Link. 8) Simpson, Will, Classic Rock, The Story Behind The Song: She's Not There by The Zombies, April 2, 2008, Link. 9) Songfacts, She’s Not There by The Zombies, Link. 10) Flans, Robyn, Mixonline, Classic Tracks: “She’s Not There, The Zombies, June 2, 2015, Link. 11) Johansen, Claes, The Zombies: hung up on a dream, 2001, Pages. 74–75, 80–81. 12) Whitburn, Joel, Top Pop Singles 1955-2002, Page 786. 13) Whitburn, Joel, Billboard Hot 100 Charts The Sixties. 14) Wildsmith, Steve, The Daily Times, Fifty years after success of ‘She’s Not There,’ The Zombies rock on, April 9, 2014. Link. 15) Wikipedia, Tell Her No, Link. 17) Runtagh, Jordan, People Music, The Zombies’ Odessey and Oracle: An Oral History of the ‘60s Rock Masterpiece That Rose from the Dead, April 17, 2017, Link. 18) Wiser, Carl, Songfacts, Interview with Colin Blunstone of the Zombies, September 25, 2015, Link. 19) Krakow, Paul, Chicago Reader, Colin Blunstone of the Zombies on fake bands, fake names, and how he’s kept his amazing voice, March 15, 2018, Link. Photo courtesy of Malay Mail Online.